Birth injuries sustained by children can range from mild to severe, temporary to permanent, and affect every part of the human body. When birth injuries are caused by medical malpractice during pregnancy or the labor and delivery stages of a child’s birth, the negligent parties may be held legally responsible through legal action. The types of birth injuries mentioned below are only a few of the many kinds of injuries that may be caused by medical negligence. Birth injury lawyer Jeffrey Killino has wide-ranging experience with birth injury cases arising out of the negligence of hospitals, clinics, and/or medical personnel. If you believe your child sustained a birth injury due to medical negligence, contact attorney Killino at 877-412-8490 for a cost-free evaluation of your case and additional information about your legal rights and options. Spinal cord injuries can occur during childbirth in a number of ways. The negligent overextension, stretching, rotating, or pulling on a baby’s neck or head during breech or other difficult deliveries, for example, can cause damage to the neck portion of the baby’s spinal cord, the part of the spine where most spinal cord birth injuries occur. Spina bifida injuries may be enhanced when medical personnel who are unaware of the condition (due, for instance, to a negligent failure to diagnose it during the mother’s pregnancy) come into contact with exposed nerves. Shoulder dystocia is a childbirth complication that occurs when a baby’s shoulders become caught on the mother’s pelvic bones during delivery, because the mother’s birth canal is too small to accommodate the baby’s size or because the baby presented in an abnormal position. When medical personnel assisting in the child’s birth negligently manage the condition, facial injuries, broken bones, or nerve damage may result. Nerves in the brachial plexus may be torn or otherwise damaged, resulting in brachial plexus palsy and other palsy injuries. Brachial plexus palsy injuries, a general term that encompasses several types of palsy injuries, can affect the upper portion of the arm, shoulder, and/or hand. An Erb’s palsy injury often affects the upper portion of the arm, while a Klumpke’s palsy injury can affect the lower portion of the arm, wrist, and/or fingers. Birth injuries related to Caesarian Sections (C-Sections) may be caused by the negligent performance of a C-Section or by the negligent failure to timely order a C-Section when one is indicated. Errors during a C-Section can cause fetal lacerations, which may result in, among other things, facial injuries, cervical cord injuries, brachial plexus injuries, and fractures. Brain injuries may occur as a result of the negligent monitoring of mother and fetus during the procedure or the negligent administration of anesthesia. In addition, when a C-Section is indicated and not timely ordered, birth injuries caused by an ill-advised vaginal delivery may occur. These can include shoulder dystocia, fracture, and delivery-assistance-device injuries. Delayed C-Sections can also cause cerebral palsy and other brain injuries. 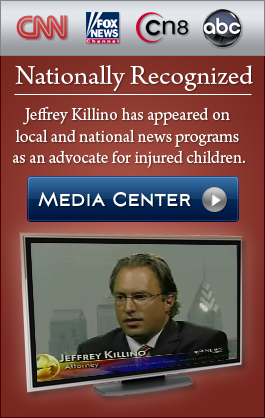 If your child suffers from a birth injury caused by medical malpractice, birth injury attorney Jeffrey Killino can help you obtain the justice your child deserves. Contact attorney Killino at 877-412-8490 for aggressive and experienced assistance with your birth injury case.